Now, there are many, many bookish things that make me ridiculously giddy. Books that make me laugh until I wet myself, phenomenal illustrations in picture books, authors that pull off multiple narrators with finesse, Neil Gaiman, Mo Willems, John Green, etc, etc. But at the top of that list is retellings and revisionings of old stories. Friends, they make me swoon. 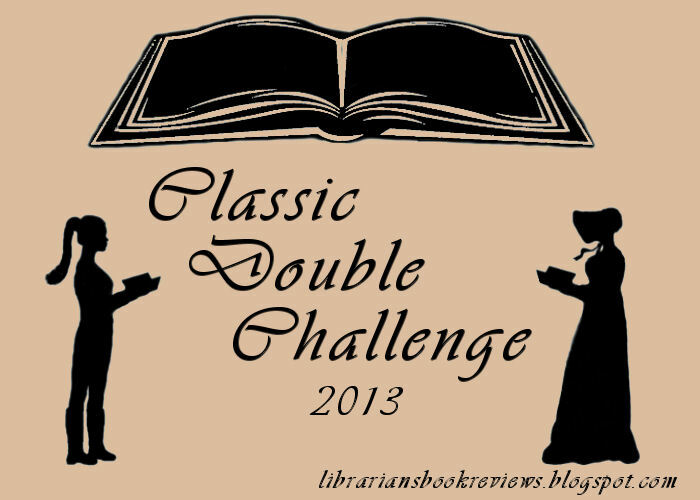 So when Jessica over at The Bluestocking Society announced she was breaking her challenge ban to join the Classic Double Challenge, I hesitated for about .5 seconds before deciding to join as well. I’m going to start off “small” and plan to read just two books (one classic, one retelling), but there’s a good chance I’ll read more than that by the end of the year. I haven’t decided which books to read, though. I’m leaning towards rereading Oedipus Rex by Sophocles and The Darker Face of the Earth by Rita Dove. 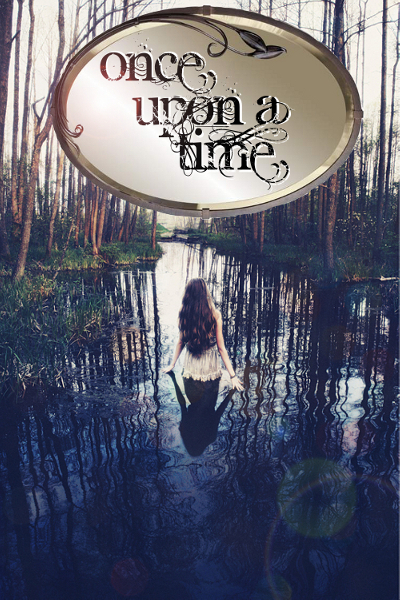 I’m also a huge sucker for fairy tale retellings, so I’m going to check out Melissa’s list for ideas. I may also steal one of Jessica’s ideas; perhaps Twelfth Night by William Shakespeare and Illyria by Elizabeth Hand or another Shakespeare/retelling combo. Anyone else joining this challenge? (If you’re not, you should! We can be giddy together.) Any book suggestions? It’s time again for one of the most popular reading events in the book blogosphere – R.eaders I.mbibing P.eril (R.I.P. for short). This is the seventh year Carl of Stainless Steel Droppings has hosted this event and the third time I’ve participated. I’m ridiculously excited about this event, especially since the weather in Virginia right now is absolutely perfect for a shivery read – cloudy, cool, and smelling of autumn. My plan is to read at least one book as well as participate in Carl’s group read of The Graveyard Book in October. (I actually reread it just last year with the 5th-8th grade book club I host at the library.) I don’t usually listen to a lot of audiobooks but I may listen to this one. Last year I heard a clip of Neil Gaiman reading it and it was fantastic. You should definitely sign up for R.I.P. VII if you haven’t already! It’s a blast. No blog necessary; anyone and everyone is welcome. 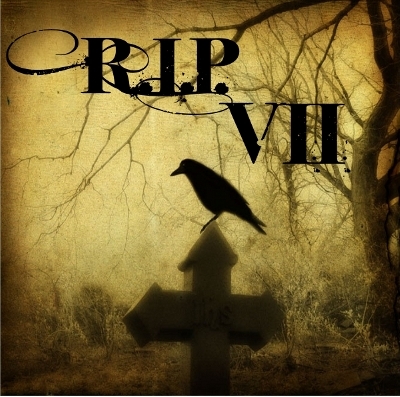 Check out the R.I.P. VII post if you have questions. Hope your autumn is filled with hot cider and great reads! This final Neverwhere Read Along post is coming to you many, many weeks late, but alas, such is life. The library is always crazy busy in the summer and my personal life was a bit nutty for awhile there, too, so my blogging has suffered. 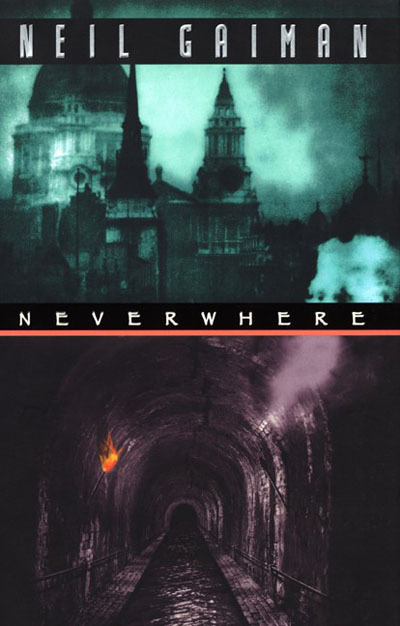 I really wanted to get this post up, though, if only just to say what a fantastic experience the read along was and how much I enjoyed Neverwhere. When I found out who Croup and Vandemar were working for, I gasped out loud. Once I resumed breathing, and thus supplying much-needed oxygen to my brain, the obviousness of it hit me like an anvil. It made perfect sense. Who else could it be? This is London Below, where darkness and the creatures and people we expect to be evil are not. Why wouldn’t the opposite be true as well? Then I found myself trying to recall everything everyone else participating in this group read had said about all the characters in the book. Unless I’m remembering incorrectly, (and there’s a very good chance that I am, since I read a lot of posts in a short period of time), the people who were rereading Neverwhere had been decidedly silent about this particular character. In hindsight, I should have paid closer attention to who said what about each character because I probably could have figured this out a lot sooner if I had. I wasn’t surprised by the ending, but that didn’t bother me very much since half the fun of reading Gaiman’s work is the journey he takes you on, not the destination. That being said, I did expect Richard to change his mind about returning to London sooner than he did. It was fitting, though, that he went through another “ordeal” before he could return. He still needed to figure out exactly who he was and what he wanted from life, and in fielding the real Gary’s doubts about his sanity he realized the truth about himself. I love that he created his own door, and that the marquis was the one to greet him (in typical marquis fashion, of course). And that’s about all my brain has to offer at the moment! I enjoyed this book immensely and the read along was a barrel of fun. Thanks to Carl for being such a superb host, and thanks to the bloggers who stopped by and commented here. You all rock. Here’s the second round of questions for the Neverwhere Read Along! I’m so glad I signed up for this. I’m enjoying myself immensely. 1. Chapter 6 begins with Richard chanting the mantra, “I want to go home”. How do you feel about Richard and his reactions at this point to the unexpected adventure he finds himself on? I don’t really blame Richard for wishing he was home since he now has, as he put it, “the projected life expectancy of a suicidal fruitfly” (89). In fact, I think that’s the reaction many protagonists have when they find themselves on unexpected adventures. Didn’t Alice and Dorothy just want to go home, too? Before he can go home (if he ever does), however, I think Richard needs to learn how to be a more active, and less passive, participant in his own life. 2. The Marquis de Carabas was even more mysterious and cagey during the first part of this week’s reading. What were your reactions to him/thoughts about him as you followed his activities? 3. How did you feel about the Ordeal of the Key? At first I was a little confused about what was going on, and then it just made me terribly sad. All those people driven to end their own lives . . .
4. This section of the book is filled with moments. Small, sometimes quite significant, moments that pass within a few pages but stick with you. What are one or two of these that you haven’t discussed yet that stood out to you, or that you particularly enjoyed. “There are no shepherds in Shepherd’s Bush. I’ve been there. It’s just houses and stores and roads and the BBC. That’s all,” pointed out Richard, flatly. And just like that, Gaiman has me wondering, slightly nervously, about the shepherds in Shepherd’s Bush. In just a few short lines, with seemingly little effort, he’s added yet another dimension to this world he’s created. He gives us just enough information to get our imaginations racing, which I think is far more effective writing technique than if he had described in detail just why we wouldn’t want to meet these shepherds. 5. Any other things/ideas that you want to talk about from this section of the book? 1. What do you think of our two villains thus far, Messrs. Croup and Vandemar? Neil Gaiman has a knack for creating shadowy, intelligent villains with lightning reflexes who seem to anticipate your every move and appear and disappear without warning . . . like Croup and Vandemar. I admit it’s an impressive knack, but they completely creep me out. 2. Thus far we’ve had a small taste of London Below and of the people who inhabit it. What do you think of this world, this space that lies within or somewhat overlaps the space the “real world” occupies? I feel a little in the dark about London Below. When Richard first encounters the rat-speakers, Lord Rat-speaker accuses him of being a spy from the “Upworld.” But how on earth could he be a spy if no one back in London can see him anymore? The man who brought him to the rat-speakers could see him, however, so there must be people who can reside in both worlds. At this point, I have more questions than thoughts about London Below. 3. What ideas or themes are you seeing in these first 5 chapters of Neverwhere? Are there any that you are particularly drawn to? 4. We’ve met a number of secondary characters in the novel, who has grabbed your attention and why? This will probably sound odd, but one of the many secondary characters who has grabbed my attention is the rat, Master Longtail. Even though we never hear what he says (just what other people say he’s saying), his personality shines through anyway. The fact that he steps in and orders Lord Rat-speaker to spare Richard’s life and take him to the market makes me wonder what, if any, greater role Master Longtail plays in the story. 5. As you consider the Floating Market, what kind of things does your imagination conjure up? What would you hope to find, or what would you be looking for, at the Market? 6. If you haven’t already answered it in the questions above, what are your overall impressions of the book to this point? So far I’m really enjoying Neverwhere. I had a very hard time putting it down at the end of Chapter Five. As I read, I marveled – once again – at what a masterful storyteller Gaiman is. Rather than describe his characters, he reveals their personalities through their own words and actions and those of the characters around them. His references range from overt to subtle (I got the Bob Marley reference in the middle of Chapter Five, but nearly missed the Alice in Wonderland reference 11 pages later). And above all, he’s entertaining. While I don’t think Neverwhere will end up on my All-Time Favorite Neil Gaiman Novel list, it’s still a great read. Sometimes I think I live under a rock. I’m going into my third year of blogging and this is the first I’ve heard of the Once Upon a Time Challenge. How have I missed this? I sure hope the rock I’m living under is comfy, ’cause apparently I spend a lot of time there! The Once Upon a Time Challenge is hosted by one of the best challenge hosts out there, Carl at Stainless Steel Droppings. Like the R.I.P. Challenge, there are several participation options so even the busiest of readers can partake in the event. The challenge lasts until June 19 (good news for me since I’m joining a month into the challenge). I’m going to participate at the “Journey” level, which basically means I’m participating without committing myself to a specific number of books. Perfect! Yep, folks, that’s three months dedicated to fairy tales and more. Life is grand. Anyone else joining in the fun? What are you reading? What do you think I should read? Previously on The Alcove . . . Your very own copy of The Alcove delivered personally to your inbox!